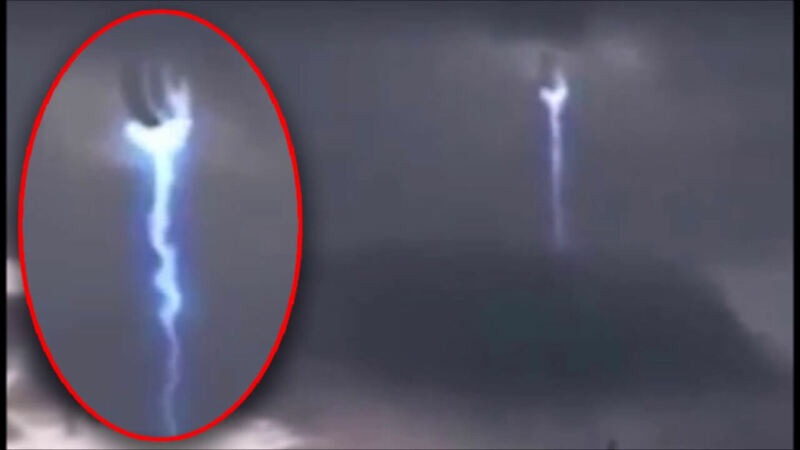 Home » [VIRAL] VIDEO OF AZ PLASMA ENTITY- UFO OR EVIDENCE OF BLUE BEAM HOLOGRAM? The controversial video was posted to Facebook yesterday and in a very short period, it was viewed and shared thousands of times. According to the uploader, the video was shot this month in Arizona and the comment section proves one thing: people are alarmed about what implications the presence of this plasma entity might have. The video shows an undisclosed neighborhood in Arizona on an overcast day when suddenly, a streak of electric blue light is seen ascending through the clouds. The ethereal jet appears to be left behind by a capsule-looking object that bursts through the humid atmosphere. Before disappearing from view, the object makes contact with another entity and this could be interpreted as a docking process between two distinct UFOs. But upon closer inspection, things become even more shocking. When the video is slowed down and zoomed in, the details of the first object become apparent. Its shape is eerily reminiscent of an elongated, extraterrestrial-looking head. The object it comes into contact with bears a striking similarity to an alien hand with fingers that are longer than yours. The ‘hand’ reaches down from above the heavy clouds and grasps the trailing alien head. Both objects then disappear from view as the blue plasma-like ejecta slowly dissipates. The action takes place at least a few miles above ground, suggesting that both objects are huge. They make no attempt to shield themselves from view and this is an important detail. Whoever or whatever was behind this otherworldly apparition wanted to be seen by those below. If the objects are indeed extraterrestrial in nature, it must mean they understand and make use of symbolism. An alien hand reaching out and grabbing an alien head and then disappearing from view might signify their intentions of withdrawing from our planet. It could also mean that they are willing to offer us an unfiltered view of their appearance and that is why they chose elements of their own anatomy. Since they have been studying us for a while, they know the importance of the head and hand in our languages and cultures. These two parts signify intelligence and action and perhaps by employing these symbols, they encourage us to take our intellect into our own hands. Maybe they chose these elements arbitrarily and to each, his own interpretation works best. But if this weird occurrence was not the work of aliens but an internal event, things turn much darker. The recent increase in worldwide seismic activity seems to prove Step 1 is well underway. Various theorists claim that either HAARP or CERN are behind the recent wave of earthquakes that hit Italy, New Zealand and Japan. Step II of the Blue Beam Project would involve an enormous space show, generated by advanced holograms and laser projections in all corners of the globe. Hit by its hidden fears, humanity would feel vulnerable, and mayhem would take over major cities as the prophetic visions of the world’s religions would play in the sky above them. Carefully-simulated attacks would rise panic to unprecedented levels. Steps III revolves around advanced LF (low frequency), VLF (Very Low Frequency) and ELF (Extra Low Frequency) transmissions that would directly interfere with the subjects’ (read: us) brainwaves, leading them into believing their divinity is communicating with them. Once this maneuver is successful, the world is ready and the stage is set for the introduction of the so-called New Messiah who would establish worldwide peace at the cost of everyone’s freedom. Project Blue Beam is one of the most hideous scenarios and it’s little wonder people shiver at the mere thought of it happening. The prospect of this recent video being proof that the gears of Blue Beam are set in motion is troubling, to say the least. Fortunately, we have one weapon at our side. Knowledge. It’s much harder to be fooled when you know you’re being tricked. Keep your eyes open and don’t believe what you’re being told. Pass information through your judgement’s filter and be watchful. My personal take on this video is this video — like many others before it — shows the activity of an advanced extraterrestrial intelligence. Or it could be fake, that possibility is always there.